• For quantitative determination of sorbitol dehydrogenase enzyme activity. • Fast and sensitive. Linear detection range (20 μL sample): 0.1 to 125 U/L for 12 min reaction. • Biological samples e.g. plasma, serum, urine, tissue and culture media. • SORBITOL DEHYDROGENASE (SDH) is an enzyme that catalyzes the interconversion of sorbitol and fructose. 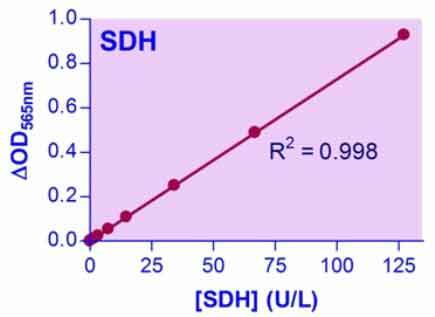 Elevated blood serum SDH levels indicate liver damage; thus, SDH plays an important role in the diagnosis of liver disease, especially in combination with aminotransferases. SDH levels are also measured to evaluate diabetic complications such as proliferative diabetic retinopathy. BioAssay Systems? non-radioactive, colorimetric SDH assay is based on the reduction of the tetrazolium salt MTT in a NADH-coupled enzymatic reaction to a reduced form of MTT which exhibits an absorption maximum at 565 nm. The increase in absorbance at 565 nm is directly proportional to the enzyme activity.